What size dumpsters do you have available to rent? What can and can't I load into the bin? •	Brick & block - interlock, paving stone, house brick, patio stone - Please inform us prior to drop off if you are throwing away these items! Who do you provide bin rentals for? Whether you are a homeowner, contractor, or a business, everyone needs waste removal at one time or another! We don't discriminate when it comes to bin rentals. We serve Kingston and the surrounding areas, including; Deseronto, Napanee, Erinsville, Tamworth, Parham, Ompah, Sharbot Lake, Kingston, Amherstview, Odessa, Westport, Seeleys Bay, Gananoque and even Howe Island, Wolfe Island and Amherst Island... If your area isn't listed, give us a call anyway to see if we service your area. How can I book a bin? Just give us a call at 613-530-2468, or send us a message through our Contact Us page! Prices for the dumpster rental and time included can vary by your location - please contact us at 613-530-2468 or email Info@FirstCapitalDisposal.ca for more information on pricing. How soon can a dumpster be delivered? Usually we can deliver a dumpster with 1-2 days' notice, same-day deliveries can be possible as well. It's always best to plan for your dumpster a few days in advance so we can best meet your timing and size requirements. Are we able to extend or shorten our dumpster rental? Our dumpsters come standard with a 7 day rental, however if you need more time or would like it picked up earlier, just let us know! What time will the dumpster be dropped off and picked up? Deliveries and pickups are generally between 8:00 a.m. and 5:00 p.m. between Monday and Friday. My driveway is a little small, can you put the dumpster on my lawn? Yes, we can place the dumpster anywhere on your property. 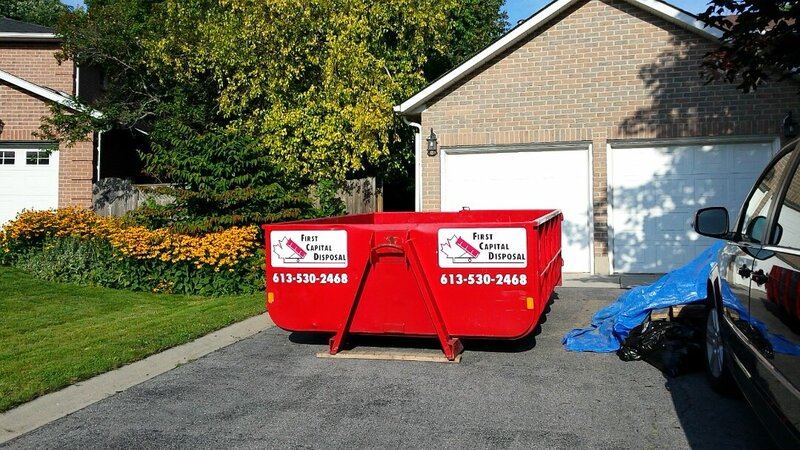 We do our best to prevent damages and may suggest against placing it on your lawn during the spring when the ground is soft, however we do not assume any liability with damage to your property due to dumpster placement. At the time of booking, we secure your bin rental by charging your credit card for the cost of the dumpster, plus HST. Once the dumpster is picked up and dumped, we will contact you to confirm the weight disposed of, and process the final payment.